Virtual reality is finally upon us. Decades ago, many people laughed at the idea of being able to create immersive technology. Back then, they thought it was downright impossible. However, today we are witnessing the rise of a new technology revolution. That is to say, virtual and augmented reality are transforming the way businesses across various industries operate. The primary idea of virtual reality is to take the user into a digital world. Augmented reality, meanwhile, involves imprinting digital elements into the real world to enhance user experience. Both technologies have come a long way over the years. For example, their applications now extend far beyond the gaming industry. The following are 5 of the most exciting ways virtual reality can affect your business. Virtual reality wouldn’t be as successful as it is today if it didn’t bring anything new to the table. It’s more than just having users wear a headset and stare at a screen. Immersive technology lives up to its name, as it enables you to find ways to bring intangible experiences to customers. To get a firmer grasp of how you can use this technology for growing your brand, check out this infographic from MDG Advertising. Companies will leverage virtual and augmented reality to come up with an accurate picture of what they’re trying to build. Moreover, prototyping will improve leaps and bounds thanks to immersive technology. This allows for improved product design, as you can get useful insights from the get-go. Spotting potential issues during the early stages of the design process can potentially save your business a lot of time and money. It’s already possible to get in touch with colleagues at any time you want, but virtual reality ratchets things up a notch. Aside from meeting face-to-face with other professionals, immersive technology makes collaboration so much more efficient and convenient. For instance, a repair specialist from a remote location can lend advice as to how to fix the issue without even being there physically. Such collaborative efforts can be done in real time, which opens up a world of possibilities. Every marketer knows that consumers feel more confident about purchasing after they try out a product for themselves. The problem, however, is that it’s not always convenient to have them try your product due to a variety of reasons. With immersive tech, you can set up your own virtual trade show. Imagine creating a virtual demonstration for customers, letting them get a feel for what it’s like to own your product. A prime example is the automotive industry, with manufacturers offering a virtual driving experience to allow customers to experience driving their cars. It can be costly to train new employees, and the use of traditional techniques often falls short of expectations. Virtual and augmented reality technology offer a new approach to training your workforce, enabling them to experience real-world scenarios that better prepare them for work. Real estate agents, for example, can use immersive tech to practice their pitches while giving clients a tour in a virtual clone of the units being sold. The applications of virtual reality now seem limitless, and it’s high time to embrace the technology if you want to gain a competitive advantage. 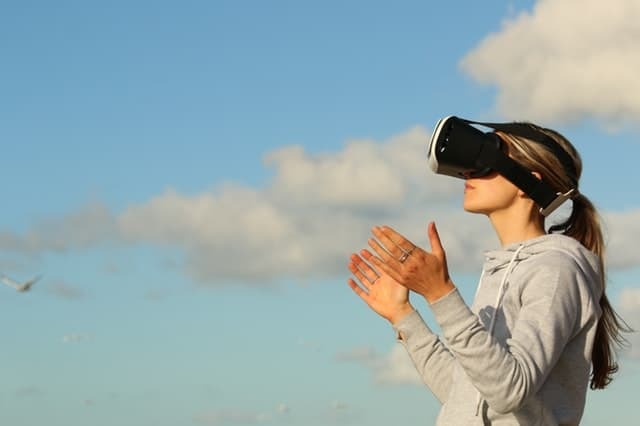 Think of opportunities to incorporate virtual reality in your marketing efforts and you’ll likely be rewarded for being one of its early adopters.